Located on the grounds of the Merrimack River Coast Guard Station along the waterfront in Newburyport. By 1764, Newburyport was a thriving shipbuilding and trading center. After the Revolutionary War, where the area made major contributions in helping the Colonists, shipbuilding began to decline and the harbor was becoming a major fishing, whaling, and trade port. The harbor was still considered important to the new country's defense. George Washington and John Hancock met in Newburyport in 1789 to discuss the building of America’s first “cutter” vessel for local protection, which has evolved into a national fleet of ships known as our current “Coast Guard” that protect our harbors. In 1844, the first Clipper Ship was built in Newburyport, which was sleek, fast, and became the choice of many merchants for international and domestic trade and played a major role in aiding the expanding American economy. Newburyport became a major center for trade from Europe, the West Indies, and China. The Custom House, where these diverse vessels had to register their cargoes, is currently a Maritime Museum which provides exhibits of the maritime history in Massachusetts. 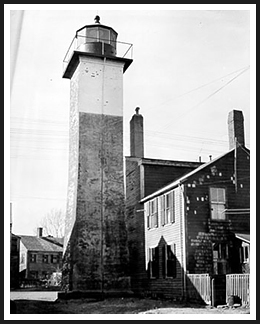 Range lights, or leading lights, were located at a distance apart to allow mariners to line the front light, which was generally shorter, above the taller rear light to indicate the center of a channel. During the Colonial period, fires were set up on Plum Island's beaches to aid mariners. In 1783, the Marine Society of Newburyport erected two day beacons as early range lights and employed locals to hoist lanterns on top of them each night. These private range lights were welcomed aids to those mariners coming along the Plum Island coastline to the mouth of the Merrimack River. Later, in 1788, two wooden lighthouses were built on Plum Island by the locals and provided more needed help for mariners wishing to enter the Merrimack River. For those vessels entering the harbor in Newburyport, there were no navigational aids and it became apparent that another set of range lights were needed to help mariners navigate two miles up the river to reach Newburyport. Near the waterfront of Newburyport Harbor, a dangerous reef known as Goose Rocks, also known as the Half Tide Rocks were wreaking havoc with mariners as shipping increased in the area. 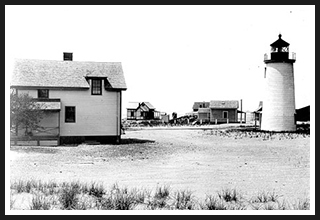 For years a pair of range lights in Newburyport Harbor were built and maintained by the locals until a petition was granted by the federal government to build two range lighthouses in 1873. The Newburyport Range lights were built to guide those ships entering the Merrimac River into Newburyport Harbor, and around the dangerous Goose Rocks. They are currently one of the few operating range lights in New England. You can book a reservation to have dinner atop the tower of the Newburyport Rear Range Light (brick tower) and get a great view of the harbor and streets below. Newburyport offers plenty of history, shops, events, concerts, and great restaurants. Nearby is the Parker River National Wildlife Refuge on Plum Island for hiking, and bird watching, along with its majestic clean beaches to get help you connect with nature. The Newburyport Whale Watch offers dinner cruises, fireworks cruises, fishing, whale watching, and you can take a trip out to New Hampshire's Isles of Shoals to explore the islands and view White Island Lighthouse. If you enjoy live music, try out the Newburyport Blues Cruise, as you travel down the Merrimac River. For educational wildlife cruises or harbor sunset cruises in Newburyport Harbor, try Harbor Tours. The Firehouse Center for the Arts provides all kinds of entertainment in music, dance, theater, film, and art exhibitions. If you are interested in period architecture, the Newbury Historic District is an outside museum of 27 reconstructed and restored buildings from 1650 to the early 1900's. You also visit the Spencer-Peirce-Little Farm and explore unfurnished rooms that openly reveal three centuries of construction techniques. Maudslay State Park features 19th century gardens, meadows, and towing pines along the Merrimac River with plenty of trails for walking, biking, or even horseback riding. Visit the Custom House Maritime Museum containing exhibits from Newburyport’s over 300-year history as a major shipbuilding seaport, (978) 462-8681. From Route I-95 west of Newburyport, take Exit 57 and travel east on Route 113. After crossing Route 1, turn left onto Fruit Street and follow it until it ends at Water Street. Fruit Street will become Fair Street along the way. Turn right on Water Street, and then left at the Newburyport Harbor Rear Range Light. 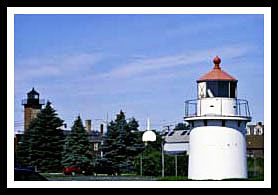 The front range light, located on the grounds of a Coast Guard station, can be seen through a fence from the parking lot north of the rear range light. From U. S. Route 95N, take exit 57 to Storey Avenue. Take a right onto Storey Ave, then right onto High Street. From High Street, take a left onto Summer Street, to Merrimac Street. Merrimac Street turns into Water Street. Located along the waterfront in Newburyport. From US Route I-95 west of Newburyport, take Exit 57 and travel east on Route 113. Turn right on Water Street, and the lighthouse made of brick will be on your left between Fair Street and Independent Street. You can also see the front range light by the harbor. From U. S. Route 95, take Route 113 into Newburyport. Follow a few miles past a "Welcome to Newbury" sign. At the next light, you'll see a sign for Plum Island, take a right at that light and follow to the end. At the end of the road, take a right then a left and go over the bridge that places you onto Plum Island. You can park for the day and go onto the beach with small stores nearby to get snacks. To go on the beach on the Parker River Wildlife Refuge, or to take in wildlife and birding, take the first right after the bridge and follow to the park gate. Lot 1 is the first beach area and there are also others. Continue down the road for wildlife viewing. Boat cruisess mentioned below may offer many types of cruises. While some may offer specific lighthouse cruises, some will pass by the lighthouse as part of charters, narrated wildlife and historic tours, ferrying passengers, whale watching, fishing tours and other types of excursions. Weather is also a major factor in New England, especially on sailing excursions. Charters may be available to provide trips to specific lighthouses. 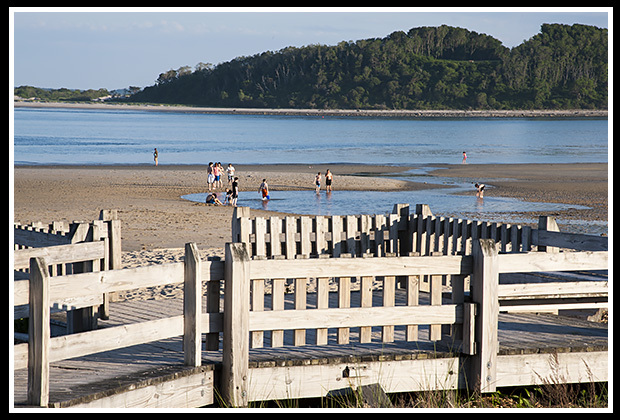 Contact info is provided to help you plan your special trips ahead of time and to answer questions before you arrive at any of New England’s coastal destinations. Enjoy! Offers various eco, wildlife, sunset and dinner tours that may pass by the lighthouses. Fishing, whale watching, dinner and fireworks cruises leave the harbor by the range lights and sometimes Plum Island light. Cruises also provided to Isles of Shoals (White Island lighthouse. Offer periodic tours inside the Plum Island (Newburyport Harbor) lighthouse, and Newburyport Range lighthouses. Live music provided and sometimes will pass by the range lights heading out of the harbor. My 300-page book, Lighthouses and Coastal Attractions of Southern New England: Connecticut, Rhode Island, and Massachusetts, provides special human interest stories from each of the 92 lighthouses, along with plenty of indoor and outdoor coastal attractions you can explore, and tours. There's info on how Newburyport was the original site for the beginnings of our current Navy.